The South Fork American River truly does offer something for everyone. 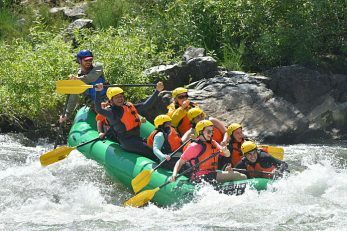 Known to be the most popular commercial whitewater rafting destination in the west, you get just the right mix of all the things people love about California whitewater – exciting rapids, beautiful scenery, interesting history and a location close to the San Francisco Bay Area, Lake Tahoe and Sacramento. 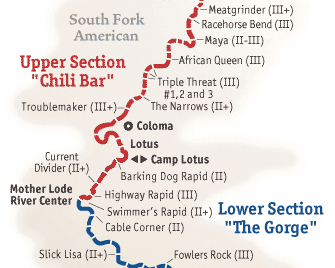 There are two sections of the South Fork: Chili Bar and the Gorge. The Chili Bar section begins upriver from Mother Lode, stops for lunch in the Marshall Gold Discovery State Historic Park, and finishes at Mother Lode River Center. The Gorge section begins with lunch at our beautiful riverside camp, puts on the water at our camp, and finishes at Salmon Falls just above Folsom Lake. *This package is available during weekdays for groups of 20 or more. *Chili Bar run is available with this package upon request. 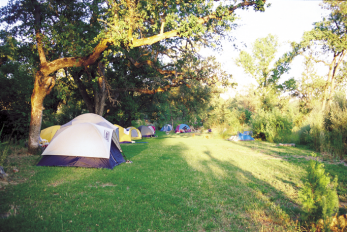 Our campground property is directly on the South Fork of the American River. That means no matter where your campsite is you will be lulled to sleep by the sounds of the water. The campground is designed with comfort and the preservation of the natural setting in mind. Looking for maximum privacy or more luxury? Check out our Accommodations page for more options : Our “Glamour” camping tents that are located in a secluded area of the camp – with beds and furniture! The Cozy River Cottage has its own bathroom and kitchen and sleeps 4 guests The luxurious two bedroom/two bath Eco-Retreat House (two night minimum) is available to large groups who are renting the Retreat Center as a venue for a private event. There are options to suit every need! We recommend booking South Fork Trips with High Ropes: Half Day.